My name is Mani Haider and I am an indie games developer. In this post, I would like to discuss the creative and technical process behind my latest game, Delirium, explaining how I became inspired to produce this sci-fi/horror game as my latest project. I was first inspired to work in games design in 2016, when I was working as a runner within the film industry and was exposed to the work of amazing concept artists working in the visual effects studio. I had always drawn as a hobby, but the experience working alongside vfx artists made me consider going into 3D work, and eventually into games (Fig. 1). As a big horror/fantasy fan I loved the idea of losing myself into a world that’s unlike our own reality. A vision that’s grandeur and more visceral than what our daily lives offer. I wanted to create something to that effect in a visual interactive medium. So, when I was in conception stage for Delirium I spent a lot of time watching my favourite fantasy/horror films, playing games, looking at paintings and reading novels. I was trying to pinpoint the central idea for the story for Delirium because all other aspects of the game will bloom out of that sapling of the core idea. Like the best horror tales, I loved tragedy and how one’s fears drive them to doing something unthinkable, and the idea of a fear or mania leading someone down the dark path and then coming face to face with the consequences of their actions. This core theme birthed the premise of the game. It became a tale of a young man losing his loved one through his own actions. After pinning down the theme of the game on the abstract level, it then became a matter of defining the central character and his arc. These three movies are a fantastic character study about the effects of paranoia on one person. They all take place in a contained setting of a single house, which was also something I wanted to explore due to the scope of this being my first game. But the interesting thing is how the setting becomes part of the character, and how this helps escalate the claustrophobic sense of dread, being walled in a small dingy place with dark shadows creeping over the walls. This movie is also another stunning example of creating the perfect mood. The small house on the edges of a dark mysterious forest filmed in this film became my inspiration for the game, so I conceptualized drawings of a mysterious house on the brinks of old ruins. This film was also a great study to show how a lurking supernatural creature can wreak havoc on an ordinary family when they are so secluded and fearful. Guillermo Del Toro’s work has always been inspirational to me. He is the master of visual fantasy and creating grounded characters juxtaposed with otherworldly settings. Pan’s Labyrinth (Guillermo Del Toro, 2006) is the prime example of that. But his work with Hideo Kojima on this small game was profoundly groundbreaking. The films I mentioned above have been incredible in teaching me about the setting, the mood and the characters, but this game showed me how visceral fear truly feels like when you are actually playing a character in the game. You control every action and this sense of interaction brings a level of immersion that’s unattainable in films. This game was a proof of what psychological horror can be, with mixed with interactive storytelling - it was the prime motivation to make my own game. All of the above artworks have been exceptional at creating a true atmosphere which feels terrifying without being overwrought and cheesy. They have been able to create a sense of dread through a compelling narrative, and detail the journey of a character that is going mad while the world around them is either indifferent or actively taking part in destroying them. However, I didn’t want a ghost jump-scaring us every too often. I wanted the madness itself to be the fearful entity, and the monster to be only one manifestation of that madness and not the centre of the story. So I devised a sense of place in my mind where certain areas would be the “encounter zones” and other areas that explored the atmosphere and story more. The first thing I always think about, when I’m writing a story, is the central idea. The conflict or dilemma around which the whole story revolves around and which also dictates the kind of mood I will set for the game. When I started writing Delirium, I spent a lot of time thinking about the main conflict that the hero faces in the story. This was all done when I was watching the above inspiring works. As I started penning down the outline of the game story, the characters and their motivations start to take shape. The story at its core would be about this man Jon and what happens to him. He is married to Anna but their relationship is strained. After honing the theme and the narrative arc of the characters I looked at more specific inspirations as I went into visualizing the setting for the game. The initial character arc of Jon and his relationship with Anna was established and I fleshed out the main conflict for Jon where he had to choose between following his hallucinations/visions or his real life/Anna. After that, it was all about filling the gaps in the story and giving the audience, the pieces of information about his past, one audio tape at a time. The rest of the story will have to be told through environmental storytelling, which I relied heavily upon. Fig. 3 - The Tape Recorder. Initially I had the idea of using journals within the game design to detail the narrative, mapping the journeys of the characters (Fig. 2). 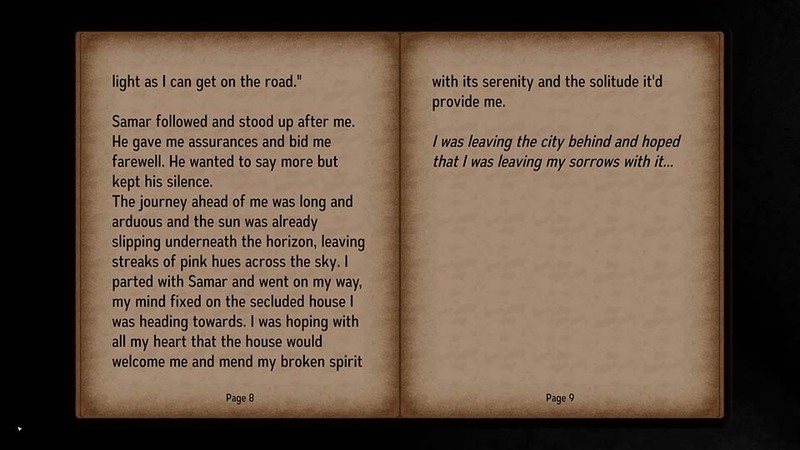 However, as Delirium transformed into a full VR game, I felt this process of reading diaries would take plays out of the immersive landscape I was trying to create. So I moved to audio diaries that will recall certain events, recorded by the inhabitant of the house (Fig. 3). Giving voice to the character gave it more of an impact, and allowed the player not bound to reading passages in one place and they can be liberated to explore while listen to the tapes. But this also meant I had to rethink the way the story will be told as the tapes had to be concise and without lengthy expositions. When I was writing the journal diaries, I spread the diaries to different sections of the house, each entry being 2-3 pages long. The benefit of journals was that I could expand upon the psychological turmoil of the character and explain his inner thoughts and how he sees the house. It was a chance to show how eschewed his perspective was and how the delusions convinced him to see everything in a new light. After I decided to record audio tapes, I had to approach the story in a new way. The character couldn’t ruminate on his inner feelings for 5 minutes. It would get tiring listening to lengthy monologues, and it wouldn’t make sense for the character to go on and on because as opposed to writing personal diaries that serve as a distressing hobby that you can indulge in, audio tapes serve the purpose of more concise record keeping. So I used this new mechanic to describe the unfolding events in a matter-of-fact fashion which added to the authenticity of the story, like listening to the black box recordings of a crashing plane. Fig. 4 - Inside Delirium. Another aspect to consider while writing a game story is finding a balance in story progression so that we see it unfold and escalate in tension chronologically without sacrificing the player freedom and their ability to move freely in the space. Once you figure that out, then it’s just about tweaking, refining the narrative and polishing key events in the game while retaining the focus on the core theme of the story. I tried to apply this principle to every step of game creation from story to asset creation, lighting and sound, which resulted in a more cohesive and unified vision for the game. This whole game project was a learning process for me. Modelling and texturing are very complex processes, as with everything in game development, but I found out quickly that I could develop these skills to almost infinity and still be scratching the surface (Fig. 4). I made my first model in the software Maya by just diving in and basically just pushing and pulling vertices until it looked right. There was no sense of topology, efficient use of polygons or any consideration for game asset creation. I learnt those things on the go. I kept my focus small and learnt how to create a 3D mesh first by just going with forms and copying them, and not worry about topology. I started practicing by copying real world objects around me, a glass bottle, keyboard, lamp etc. (Fig. 5). My first Maya 3D model was of my own keyboard (Fig. 6). The wireframe would look incredibly messy but at the start I was more concerned with getting the shape right, the curve of the keyboard body, and the concave depression of the keys, as well as their correct proportion and their spacing with respect to each other. Following more practice and knowing how the 3D assets are formed in Maya, I started breaking down the meshes into blocks. When you simplify any complex shape down to its basic form, you can start to see how you would start that out with a simple cube. This helped me in keeping a simple topology in mind when starting out any 3D asset and then slowly build complexity in layers, this will keep the topology a lot less messy so you can subdivide and retopologize later with greater ease. This same formula formed the basis for my Zbrush learning. Starting with pulling and pushes polygons and later focus on the topology and getting the details right (Fig. 7). Fig. 5 - 3D Models. Fig. 6 - My first Maya model. Fig. 7 - My first (L) and second (R) ZBrush 3D models. The technical knowledge of 3D modelling, retopology and UVmapping was very useful but I would say that it’s more important to understand on an abstract level what makes something look good, and how to create forms and shapes which are unique and attractive, because the techniques and terminology are relatively easy to learn, but it takes a lifetime to understand how to create objects or places which are striking and eye catching. Observing real world objects has been my best teacher in this regard. Nature is packed with infinite detail that helped me get up close and observe real life assets for references. Secondly nothing in nature is monochromatic, a blue sky or a green leaf each have countless variations in values within a single colour, which helped me in improving my texture work (Fig. 8). Another thing that awarded a sense of realism to my work was noticing how nothing in nature stands independently, as every object is affected by the objects surrounding it, light scattering, refraction, bounce lighting, weathering effects all shape the final look of every real life object. Fig. 8 - Texturing Delirium. Fig. 9 - Lighting in Delirium. Fig. 10 - An animated bulb that explodes when the player gets closer. Lighting in the creation of convincing animated spaces is all about trial and error and just having fun with the values to get precisely what you want. However, it’s all dependent on the kind of mood that you are creating. In my case, it was imperative to have very dark shadows to create the feeling of unease as if the darkness is swallowing the light. For this reason, I had very little indirect light in most areas of the game, leveraging the direct light from point lights and using Ambient Occlusion heavily to create much darker corners (Fig. 9). In reality, the light doesn’t behave in this manner but it was an artistic choice to serve the mood of my game and heighten the tension. It served the purpose of putting you in the shoes of the protagonist who fears that the house itself is alive and sinister, slowly creeping its shadowy fingers across the walls. I didn’t use any ambient light from Skybox or any directional light coming from sun, keeping the light source to be only from the man-made lights i.e, light bulbs. One big factor in designing the game levels is figuring out if the lighting will be realtime or pre-calculated (baked). Realtime lighting has to be calculated at runtime, and is very performance costly which means rendering complex and huge worlds with realtime lighting will make the performance very very slow without giving a tangible benefit. Realtime lighting will have an advantage if I had a changing time of day in the game where lighting will change over time, or if I have lots of destruction in the environments. This wasn’t the case for my game so I went with largely baked lighting with the exception of one realtime point light. Most of the lighting was baked, not only because realtime lights are expensive, but also because baked lighting gave a cleaner more aesthetically pleasing look and there was no need to use realtime lights unless the light was flickering. Although at one point I did play around with using realtime and baked light in conjunction to give some interesting results. At the end, I was quite glad that the whole baking process was not excruciatingly long (although it did seem to go on forever when I turned the Final gathering technique on in Maya, so I decided not to use it). The performance boost was essential for VR gameplay, so baking lights made even more sense. I have only scratched the surface in terms of what things to consider while making video games. But my goal was to get acquainted with the engine and some of the tools while having made a small game from start to finish. This was so at the end I’d have built up some experience, and learnt a few skills of game development while keeping the focus and scope in a singular direction in order to finish the game. The whole prospect of learning Unity tools was overwhelmingly daunting, but keeping the focus small and building towards a project kept me from burning myself out in exhaustion in the face of consistent learning and potentially giving up. In these last few years of diving in, I at least learned the scope of things that are possible with the tools Unity provides, which is enough to keep me excited to learn and make games at the same time. On top of that, Unity’s constant updates over the years have improved the engine dramatically and made the tools a lot easier and intuitive to control while getting great visual results. This is an additional motivation factor for me despite the fact that I have powerful tools that will each take years to master on a long road of trial and error. But that’s something I’m happy to contend with as long as I can keep seeing fruits of my frustrations. If a complete novice like me can dive into this massive warehouse-of-machinations and get some kinds of results, then all I need is just determination not to give in. In the face of failures, this simple strategy of perseverance is my only strength, all other skills are just the direct result of that singular strategy. I hope to keep making games using the knowledge I have gained so far, apply all the lessons to the next game and repeat ad infinitum. Delirium is available on Steam: https://store.steampowered.com/app/1046670/Delirium_VR/. Mani Haider is a game developer. His work began with drawings and writing short stories as a hobby before trying 3D Modelling and eventually made his way into solo game development. He created a short film about a starving cannibal family in 2016. In 2019 he released a psychological horror game Delirium, about a man who is driven to insanity when he moves into a new home.